Week I of the Atlanta Fall Classic kicked off on the 8th and welcomed big numbers to the jumper divisions. Jumper action got under way at the Olympic venue with the $5,000 Welcome and saw twenty three tackle the course designed by Paul Jewel of Lambertville, New Jersey. First round was set with a time allowed of 74 seconds and the second was set at 47 seconds. Doug Payne, of Aiken, South Carolina entered and rode three mounts to the winner's circle. As fourth to go in the order with Kelsey Calabro’s Home James, the pair posted the first double clear rounds and set the time to beat at 38.381 seconds. Macie Atwood of Brentwood, Tennessee and her own SCS Luigi followed with the next set of double clear rounds and took the lead from Payne with their 35.915 second round time. Heather Steinman of Canton, Georgia and Alexandra Doyle’s Carto’s Star's 34.751 seconds followed Atwood and took the lead which would see Atwood and SCS Luigi finish in sixth place overall. JF Gagne of Columbus, South Carolina and Lyons Creek Sporthorses, Ltd’s Lyons Creek Dragon Bleu followed with double clear rounds but their second round time of 35.936 seconds would see them finish in seventh overall. Payne returned to the arena, this time in the irons of Quintessence, owned by Jane Dudinsky. The pair bested the leading second round time with their own 34.474 seconds and took the lead. Steinman and Elisabeth Yeager’s Hot Spot challenged that time with their own clear second round of 35.176 seconds but would settle into fifth place overall. Maarten Huygens’ Fintan, ridden by Paul Macrae of Alpharetta, Georgia, followed with the next set of double clear rounds, but their time of 35.944 would see them finish in eighth place. Charles Casey of Birmingham, Alabama, in the irons of Double C Sporthorses’ CC Kolaborant also posted double clear rounds, but their second round time of 36.325 seconds put them in ninth place overall. Steinman returned to the ring, this time in the irons of Courtney Kelling’s Finnegan and looked to take the lead from Payne with their double clear rounds in a fast jump off time of 34.731, but by a mere hundredth of a second, would finish in second place. Tenth was awarded to Emily Chavez’ Morning De Reve, ridden by Gagne. Payne picked up an eleventh place for his ride on Wendy Luce’s Marshal M Dillon and Sydney Long of Atlanta, Georgia, rode her own Venchy De Bornival to a twelfth place finish. “Quintessence is the best jumper I ever rode,” commented Payne. “He’s done really well over the last few months, winning the 6 year olds in Kentucky and most recently in Princeton,” he added. 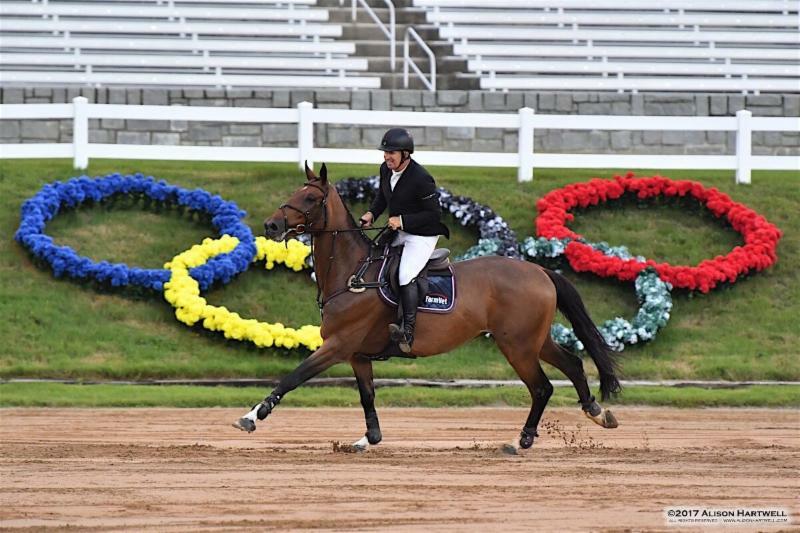 Twenty three horse and rider teams tackled the course designed by Paul Jewel on Saturday in the Olympic Arena and Tim Maddrix of Leeds, Alabama took top honors with his own Ebelina W.
The 1.25 m course had a first round time allowed of 83 seconds. Only four advanced to the jump off round which was set with a time allowed of 47 seconds. Doug Payne, winner of the $5,000 Welcome Week I, was the first to post a clear round in a time of 80.282 seconds with Wendy Luce’s Marshal M. Dillon. Maddrix followed with his own Ebelina W’ in a clear first round in a time of 81.979 which insured a jump off to the delight of the crowd. Macie Attwood and her own SCS Luigi added themselves to the jump off roster after posting their first round clear score in a time of 79.876 seconds. Payne added another ride for the jump off round with Kelsey Calabro’s Home James after posting a clear first round in a time of 78.088 seconds. As the first to go in the jump off round with Marshal M. Dillon, Payne posted a clear 42.110 seconds, well within the 47 seconds time allowed. Maddrix was up next with Ebelina W and also went clear with a time of 41.546 seconds, taking the lead. Atwood and SCS Luigi followed but with four jump faults and 12 time faults for their time of 54.516 seconds, would settle into fourth place overall. Payne and Home James sat it the desirable last to go spot, and looked to beat Maddrix and Ebelina W’s time. But a rail and four jump faults in a time of 39.081 seconds would find them finishing in third overall. “The time allowed was really snug. I tried to beat Tim’s time, but I knocked the front rail at the second element in the triple,” said Payne. “Tim rode well and had me by a second and a half off the first horse. I went for it and took a shot and well, you win some and you lose some. It’s just the nature of the sport,” he added. "I was sure Doug was going to win it and he had the time, but with the one down it was our lucky day I guess, " commented Maddrix. The final results had Maddrix and Ebelina W with the win and Payne picking up second and third with Marshal M. Dillon and Homes James, respectively. Fifth was Maarten Huygens’ Casquino, ridden by Paul Macrae with an 84.381 second first round with two time faults and Payne picked up a sixth place finish with Quintessence, owned by Jane Dudinsky for their four fault first round in a time of 76.983 seconds. Seventh place went to Sydney Long of Atlanta, Georgia and her own Take Two for their four fault first round in a time of 77.944 seconds and Caroline Michele Dugas of Birmingham, Alabama, and her own Skyfall earned an eighth place finish for their four fault first round in a time of 78.802 seconds. 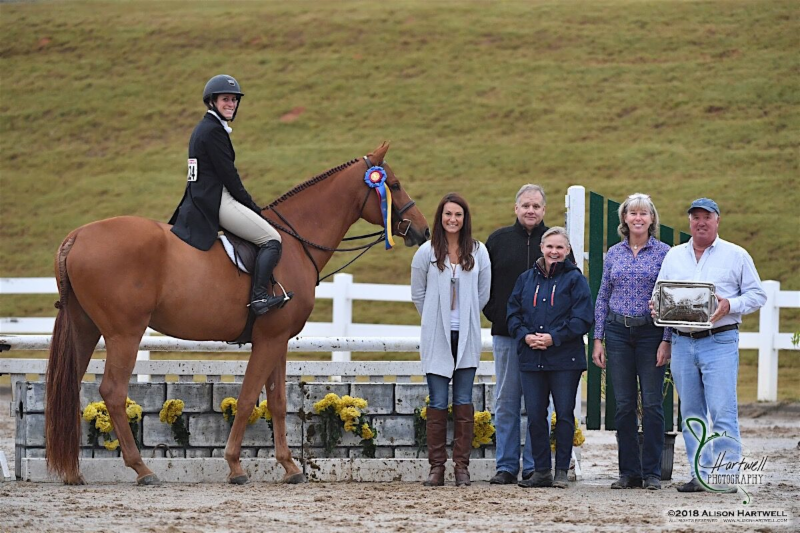 Heather Steinman of Canton, Geogria , earned ninth and tenth placings with Elisabeth Yeager’s Hot Spot and Livhaven Stables’ Itile Horta, respectively while Long returned to the ring with her own Venchy De Bornival for an eleventh placing. Charles Casey of Birmingham, Alabama, in the irons of Double C Sporthorses’ CC Kolaborant wrapped up the class with a twelfth place ribbon. Maddrix said, "I didn't get to watch much as we had two other horses in the class. Caroline Dugas was eighth with Skyfall and Camille [Maddrix] had a new six year old in her first show here in the US too. The course rode really well. I just love riding in that ring! You can pick up a gallop and just go and have fun!" "Ebelina is a new horse we recently bought in Europe. This was her first show with us and it was a perfect way for her to get to start her career in the US. She just did it so easily and we are really excited about her," said Maddrix. “Marshal M. Dillon is owned by Wendy Luce in Milford [NJ] and I’ve ridden for her for a long time. We bought him quite young and initially as an event horse. He got to the Preliminary level and it just didn’t suit him, so we moved over to the jumpers. Marshall is a beautiful horse and has really come along over the last three months,” said Payne. “Home James is a really great horse and has just got the biggest heart, When he came to us about four or five months ago, he had lost his left eye from an infection. But, the owners wanted us to play it by ear and give him a shot,” he said. “Sometimes the shadows make it a little tough for him, but he really just gives it his all.. He actually won the $35,000 Grand Prix in Charleston Week II last summer. He’s a little weird with shadows and the Olympic Arena here is a tough setting for him, but he is the most genuine and big-hearted creature,” he added. Payne continued, “We’ve got a great group here. We brought 11 horses and we have three other students showing with us too. Two of our horses are going to the Jockey Club in Ocala next week for an event and this is the perfect prep for us. They’ve done really well here and they got to jump in the big ring. I haven’t been here in a couple of years and the footing is a huge improvement over what it used to be. The rain really hit us here this week and the footing held up really well, especially with the Classic Company guys managing it-really a great job!” he added. 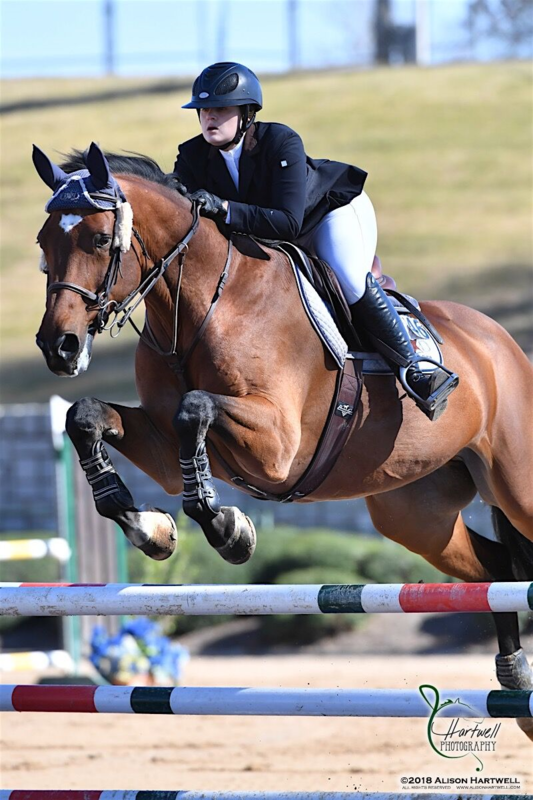 Saturday’s first installment of the $25,000 Barry Lane Classic saw 21 enter the 1.10 m class and awarded Abigail Beaty of Indian Springs, Alabama, and her own Via Dolorosa the first place ribbon for their double clear rounds in times of 73.132 seconds and 33.131 seconds, respectively. Of the twenty one entries, twelve advanced to a second round opportunity and only five went clear. Jack Dengler of Marietta, Georgia and Castlewood farm, Inc.’s Kira Van De Vaartdijk were the first to advance to the second round and set the new time to beat at 33.396 seconds. Four horse and team riders later, Beaty and Via Dolorosa challenged that time and grabbed the lead with her own 33.131 seconds. Adam Edgar of Leesburg, Virginia and Ellie Miller’s Zathura got close with their own 33.511 clear second round, but settled into a third place finish. Lucy Reich of Birmingham, Alabama and Booth Parker’s Nomination Hastak earned double clear rounds, but their second round in a time of 34.528 seconds saw them finish in fourth overall. Grace Jordan or Marietta, Georgia and Darragh Kerin’s Rossco also turned in double clear rounds, but their second round in a time of 36.930 seconds landed them in fifth place overall. Sixth was awarded to Alexandra Doyle of Canton, Georgia and her own Carto’s Star for their four fault second round in a time of 30.746 seconds. Ella Duffy of Marietta, Georgia, rode Missy Nolen’s Croft Original to a seventh place finish and Lucy Reich of Birmingham, Alabama, rode Ashley Hayden Morrison’s Cucino Z to an eighth place ribbon. Clayton Mullis piloted his own Tower Lux to a ninth place finish and Paris, owned and ridden by Jordan Keay Dillenberg placed ninth. Grace Jordan of Marietta, Georgia, rode Sarah Kerins’ Camboro to an eleventh place ribbon and Accomplice, owned and ridden by Grace Asbury of Atlanta, Georgia, wrapped up the class in twelfth place. 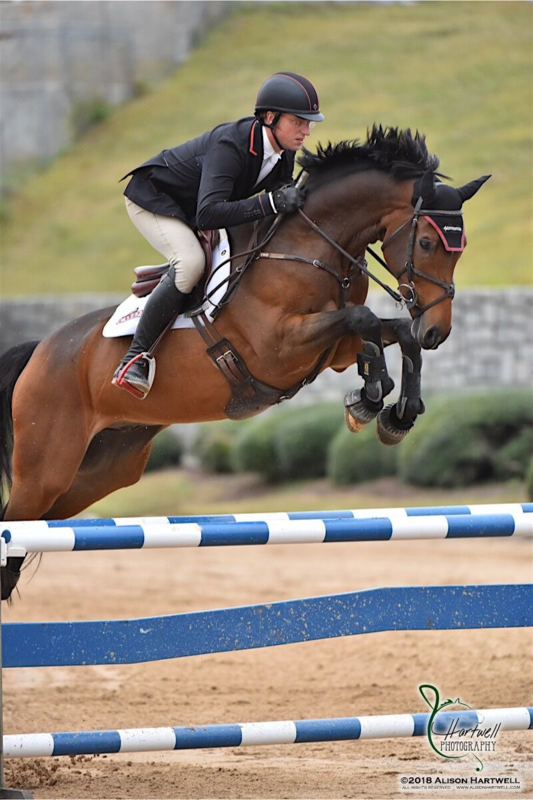 Twenty five horse and rider teams competed in the $7,500 Barry Lane Jumper Classic, the second installment of the $25,000 Barry Lane Jumper Classic, Week I at the Atlanta Fall Classic. The 1.10 m course designed by Paul Jewel was set with a first round time allowed of 77 seconds and 48 seconds for the second round. Only eight advanced to a second round opportunity. Adam Edgar and Ellie Miller’s Zathura were the first to post double clear rounds and set the time to beat in the second round at 38.783 seconds. Jordan Grace and Sarah Kerins’ Camboro tried to take the lead, but their clear second round in a time of 43.690 would finish the pair in third place overall. Doyle and Carto’s Star sat in the second to last to ride in the order of go and posted lightning fast double clear rounds. Their second round time in 37.841 seconds stole the lead and the win, moving Edgar and Zathura into the second place finish. "I thought it was a really clever course. He [Paul Jewel] is an excellent designer and really set it up so it baited you to go fast in sections, where you really shouldn't," commented Doyle. "My grey horses is pretty hot and has a lot of anxiety. My plan was to just get around the first course safely and correctly. The second round I just let him go a bit. He's a naturally quick horse and he really enjoys his job. I want to give him a good ride and don't want to give him any mental setbacks. I've had him about a year. He really wants to do well and he is so afraid that he won't do well, he freaks himself out. Hes such a good boy and I owe that horse everything," said Doyle. Isabelle Blackstone and Madison Akins’ Chasm Z finished in fourth with the fastest four fault second round in 37.819 seconds. Fifth was awarded to Lucy Reich and Booth Parker’s Nomination Hastak. Doyle returned for the sixth place ribbon in the irons of her own Wrozbita for their four fault second round in a time of 40.780 seconds. "I've had this horse for about a month. This was his second show in America and it's his first time in Conyers. I want to say he was imported a month and a half ago but he was jumping on the larger side in Europe. I Was trying horses at Paul Mcrae's and he suggested I ride him. I did and it has turned out really well. He's been a good boy. I'll definitely be showing both horses in the Barry Lane Jumper Classics next weekend," she said. 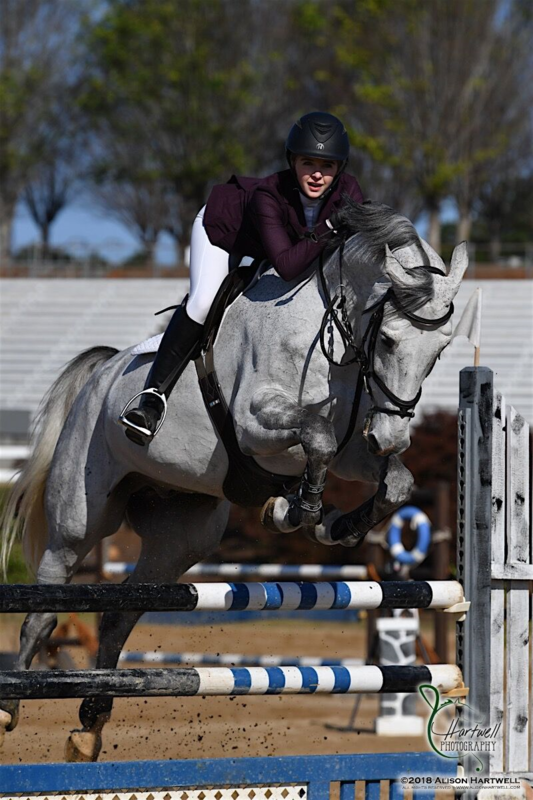 Jordan Keay Dillenberg brought home the seventh place ribbon with her own Paris and Celia Cram of Aiken, South Carolina, rode her own Auspicious to an eighth place finish. Clayton Mullis earned ninth with his own Tower Lux and Abigail Beaty rode her own Via Dolorosa to a tenth place ribbon. Grace Jordan of Marietta, Georgia, and Darragh Kerins’ Rossco placed eleventh and Grace Asbury and her own Accomplice wrapped up the class in twelfth place. 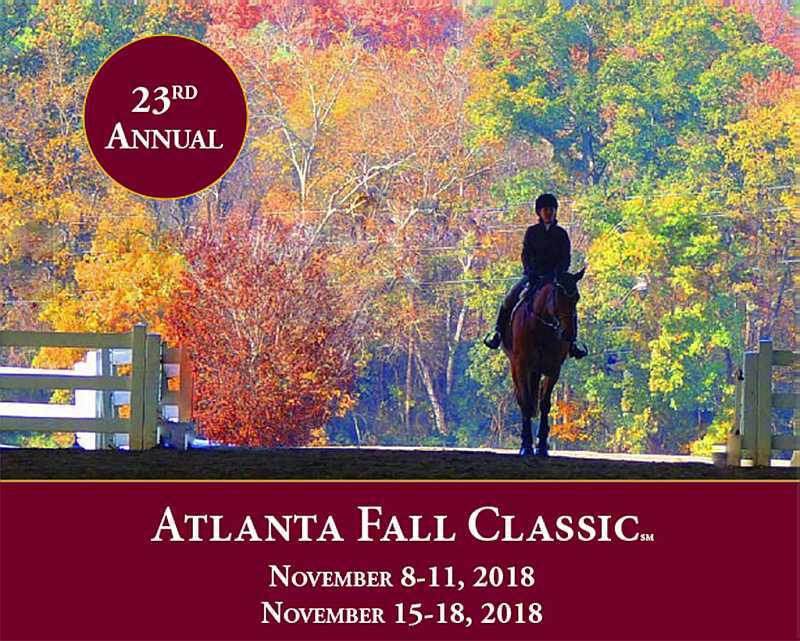 Natalie Geller of Alpharetta, Georgia rode the first and second place $3,000 Classic Hunter Derby winners to top scores Week I of the Atlanta Fall Classic. The winning ride in the irons of Holly Sims’ Sunkist, saw first and second round scores of 84, for a total of 168 which bested the competition. Her second ride, Lori Christman’s On Board, led the first round with a score of 86, but their second round score of 78 finished them in second place for a total of 164. Javite, owned and ridden by Katie Kittrell of Madison, Georgia rode to the third place ribbon with a total score of 154 and the $250 3’3” Non Pro Rider Bonus. 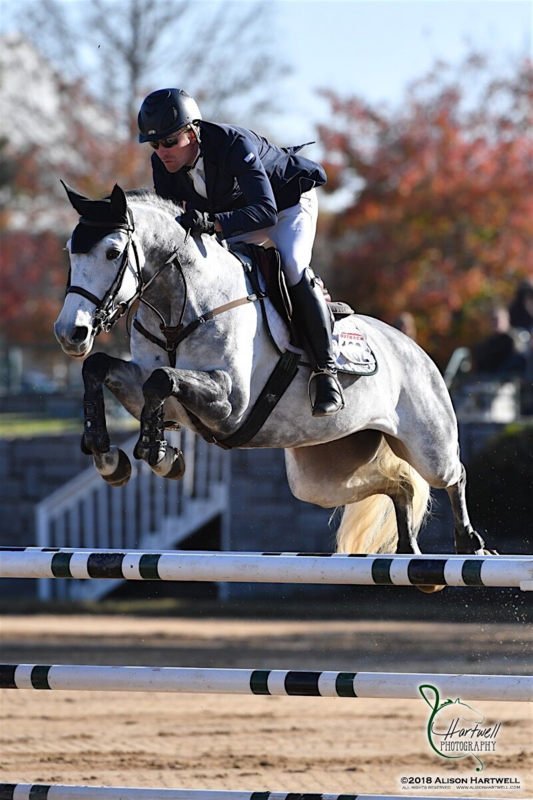 Eljero, owned and ridden by Sarah Williams of Peach Tree City, Georgia earned a fourth place for their combined score of 153 and the $150 3’3” Non Pro Rider Bonus. Low Country Phantom, owned and ridden by Laura Neely of Savanah, Georgia placed fifth for their combined score of 146 and earned the $250 3’ Non Pro Rider Bonus. Josie Evans of Covington, Georgia rode to both the sixth and eighth placings in the irons of Lynn Laird’s Mandolin and her own QVF Colt Seavers, respectively. Her performance on Mandolin earned them the $150 3’ Non Pro Rider Bonus also. Conrad 10, owned by Seven Hills Farm and ridden by Kristin Martiniello placed seventh and also earned her the $100 3’3” Non Pro Rider Bonus. Today may have wrapped up Week I, but more action is to come Week II of the Atlanta Fall Classics.. If you haven't reserved your stalls, email jonathan@classiccompany.com and do so today! Have you qualified? There is no entry fee for those who have qualified. Please click here for more information on the 2018 Zone 4 Handy Hunter Challenge Specifications. The Barry Lane Jumper Classics finish up next weekend. The classes are at 1.10 meter and will be held on Saturday and Sunday each week. Queen Sales, the provider of feed and bedding in Conyers, will also offer rider bonus money during Week II. There will be $2,000 for the Leading Child/Adult Jumper Rider, $2,000 for the Leading Jr/AO Rider and $1,500 to the Leading Classic Derby Rider, all based on Championship points over the two weeks. The Circuit standings are all posted so check it out. We’ll see you at the ring! The Gulf Coast Winter Classic Returns! Set sail for the Gulf! 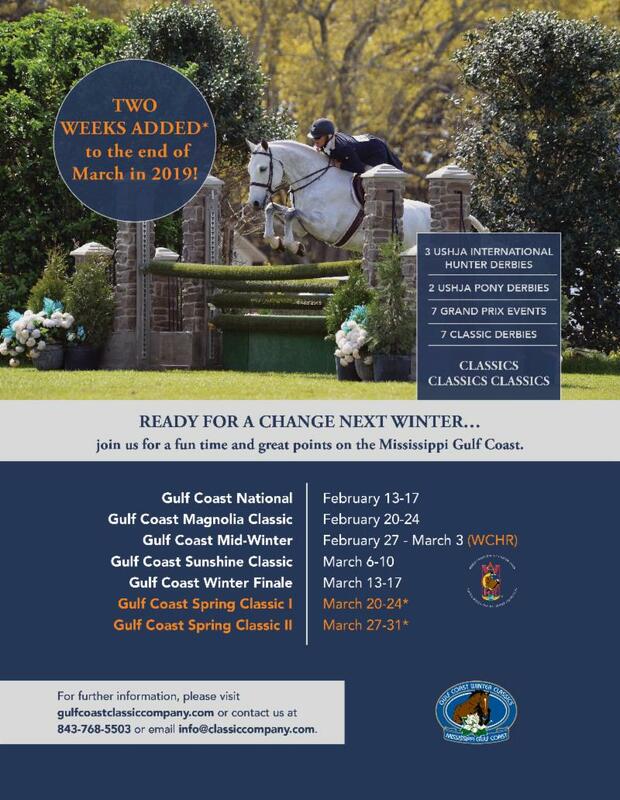 The Gulf Coast Winter Classic Circuit in Gulfport, Mississippi kicks off on February 13 through March 31 on the Mississippi Gulf Coast where the grass is always greener! World class grass turf Grand Prix field hailed as the best in the US and compared to Spruce Meadows. Permanent stabling, complimentary riders’ lounges, exhibitor appreciation parties and more than $1 million in cash and awards up for grabs! Be sure to add the Gulf Coast Winter Classic Circuit to your show calendar today! The prize list will be available soon, so be sure to sign up for our online prize list email list. For more information about the show, contact info@classiccompany.com. Exciting sponsorship opportunities are available for our upcoming 2019 Gulf Coast and Classic Company show season, so call Lisa Davis Engel at 908-310-6248 or email her. If you are interested in purchasing a program ad, please contact Drew Coster. The Classic Company’s philosophy is to offer an event for every level of rider and horse. From lead line to Olympic level grand prix competition, from seasoned veteran horse and rider team to a first time horse show experience, the Classic Company offers competition that provides the competitor substantial prize money, award-winning facilities and courses, quality competition and the best customer service in the industry. Service is what sets the Classic Company apart from other horse shows. 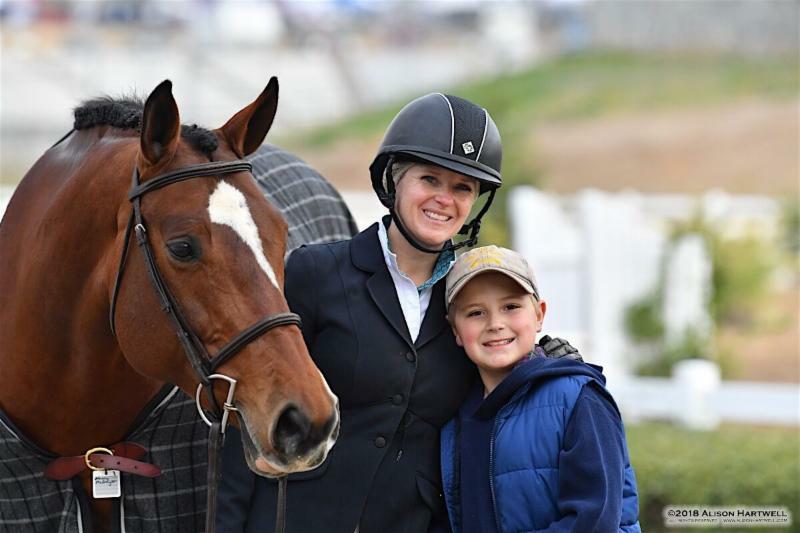 Consistently awarded the USHJA's Member Choice Award for providing excellent customer-friendly competitions, the Classic Company provides champion service from in-gates to show office at all its venues. Top competition with an emphasis on southern hospitality is their hallmark and the reason thousands prefer to compete at Classic Company produced events each year. All press and sponsorship inquiries should be directed to Lisa Davis Engel. All program ad requests should be submitted to Drew Coster. 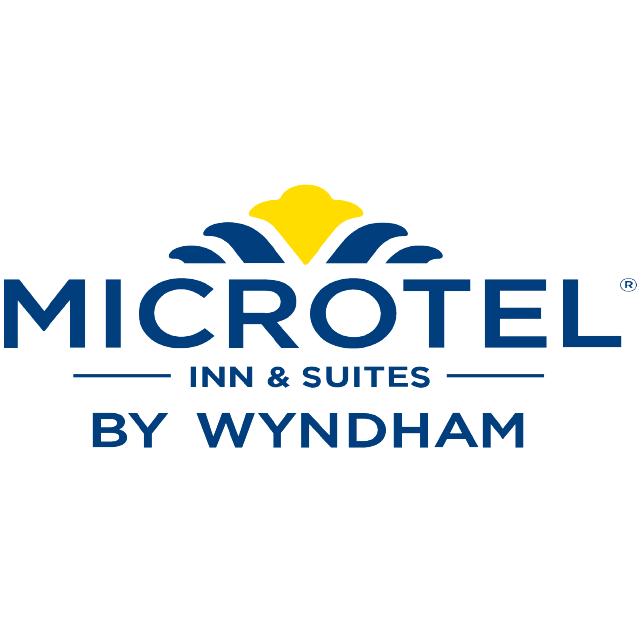 Whether traveling for business or pleasure, make Microtel Inn & Suites by Wyndham Conyers/Atlanta Area hotel, near Georgia International Horse Park, your home base for exploring the Atlanta area. Located off Interstate 25, our pet-friendly hotel is minutes from the best Conyers and Atlanta attractions. We serve a free continental breakfast each morning, and offer free Wi-Fi Internet access so you can check directions or catch up on email before you head out. When you return, park your car or oversized-vehicle in our ample free lot and head to our seasonal outdoor pool for a swim. Our on-site fitness center makes it easy to squeeze in a workout on the go. 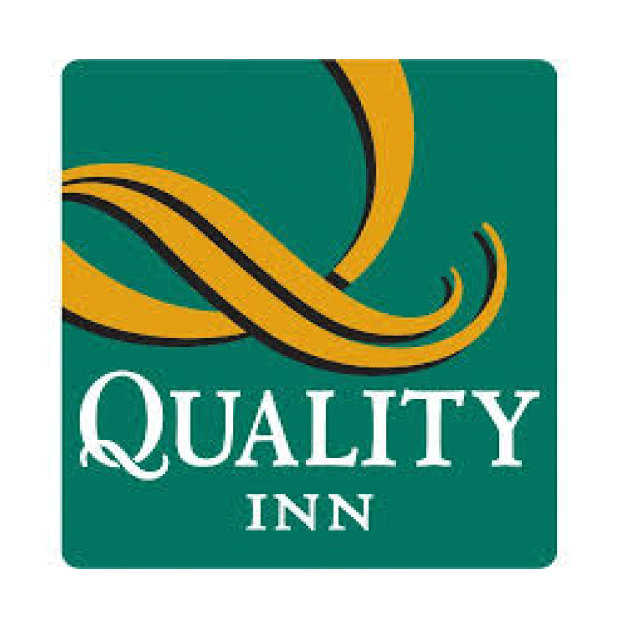 We offer non-smoking and handicapped-accessible rooms as well as suites, and kids 17 an under stay free with an adult. You'll get more of the value you want when travelling to Conyers, GA by staying at the pet-friendly Quality Inn® hotel near Georgia International Horse Park. High speed internet, fitness center, complimentary hot breakfast and outdoor pool all in close proximity to the Georgia International Horse Park and the Atlanta Classics! 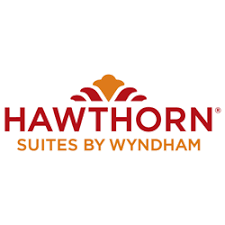 Our Hawthorn Suites by Wyndham Conyers is the only hotel within 1/2 mile of the Georgia International Horse Park, located on Centennial Olympic Parkway with easy access to I-20. Our pet-friendly, spacious and accommodating guest rooms and suites were designed with your comfort in mind, featuring an away from home kitchen in our suites. Help yourself each morning to a free hot breakfast, free WiFi, in-room microwave, refrigerator, convenience shop, fitness center, guest laundry, and free parking. Take a dip in our outdoor seasonal pool and enjoy a refreshing beverage in our onsite lounge and restaurant. Oct 06, 2018 Atlanta Fall Classics Zone 4 Qualifiers Announced! Apr 30, 2018 Plan Now for the Charleston Summer Classics! Feb 12, 2018 It's Time to Reserve Your Lodging for the 2018 Charleston Summer Classic! Jan 23, 2018 Announcing the Atlanta Spring Classics! Dec 23, 2017 Merry and Happy from the Classic and Gulf Coast Classic Companies! Nov 11, 2017 Hunter News from Week I of the Atlanta Fall Classic! Jun 26, 2017 Hometown Win for Z Coco Cabana and Glenn Hartigan and Atlanta Summer Classics Wrap Up! Jun 18, 2017 Vale is Victorious and Hunter Action Heats Up at the Atlanta Summer Classics! Jun 16, 2017 It's Time! Charleston Summer Classic Stall Reservation Deadlines are NOW! May 27, 2017 Free USHJA Zone 4 Riding Clinic with Tony Sgarlata June 19th! May 16, 2017 It's Show-cation Time! Make Memories at the Charleston Summer Classic! May 07, 2017 Countdown to the Atlanta Summer Classics! Apr 24, 2017 Jumpers Close out Week III of the Jacksonville Spring Classics! Apr 19, 2017 Winning Week II for Full Circle Farms at the Jacksonville Spring Classic! Apr 17, 2017 The Emerging Athletes Program Slated for June 11-15th! Apr 12, 2017 Jacksonville Spring Classic Weekend Wrap Up! Apr 02, 2017 Hunter News from Week II of the Atlanta Spring Classics! Mar 26, 2017 Hunter News Week I of the Atlanta Spring Classics! Feb 28, 2017 Book Your Lodging Now! The Charleston Summer Classic Prize List is ONLINE Now! It's Showcation Time! Feb 23, 2017 Atlanta Spring Classics on Deck! Enter Today! Feb 06, 2017 Arenus Signs on to Sponsor All 2017 Classic and Gulf Coast Classic Shows! Feb 03, 2017 That's a Wrap! Pensacola Winter Classics Crown Circuit Champions!